It all began at a Halloween Bassoon Recital. Captured! Cover of the May 2002 release of Captured! on Crystal Records. What is unique or unusual about the Bassoon Brothers? We are a quartet of bassoonists who dress to look similar to the Blues Brothers, but have one female member (our sole sister). The group began performing on Halloween 1985. We have found Halloween and April Fool’s Day to be our most popular concert dates. We are the first and only bassoon section of a major U.S. symphony orchestra (Oregon Symphony) to have recorded a CD. The CD called Wanted–for low down playing and bass behavior was released in 1999 and Captured in 2002, Escaped in 2007. We are the first and only bassoon quartet to have our photo in the Wall Street Journal. The article pointed out our pioneering efforts in performing chamber music in a brewpub: the Bach ‘n’ Brew phenomenon has swept the nation. Our photo was a clue on ABC’s JEOPARDY show. What is a bassoon? The question: what these two brothers are playing. We are the first and only musical group to have performed in some Oregon and California prisons… likely the first bassoon quartet to have performed in any prison. We perform not only in concert, but also for parties, wedding receptions (in one case, the wedding of two bassoonists) and funerals, schools, colleges and brew pubs. We often tour alongside the Oregon Symphony regionally, performing outreach programs. One member of the group is a jazz bassoonist which allows our musical arrangements to have an occasional improvised element. Our concert repertoire covers music from all ages and styles, and with levels of musical humor from site gags, to subltle or not so subltel musical quotes. Familiar classical and popular music allows for an enjoyable concert for every audience. Every Bassoon Brothers concert begins with Charles Gounod’s Funeral March of a Marionette a.k.a. the Alfred Hitchcock Presents TV theme (which was for one season performed by bassoons). We have learned that if we are enjoying ourselves (and can crack each other up) our audiences will enjoy us too. We feature an instrument called the tromboon– a hybrid instrument using the reed and mouthpiece of the bassoon with the trombone body. We also perform most arragements with contrabassoon (doublebassoon) whose deep belching tones always brings a smile. Some arrangements also include saxophone to add variety. Like the Blues Brothers we have a mission. Ours is to prevent the extinction of this extremely versatile but endangered instrument and encourage its performance by popularizing the bassoon through our music. Most people don’t know the instrument’s name (calling it an oboe), but know the sound. We are the first bassoon quartet in history to record a piece for Bassoon Quartet and Orchestra. Hells Angels for Bassoon Quartet and Orchestra by Michael Daugherty was released in 2003 on the DELOS label. Our back up band was the Oregon Symphony. 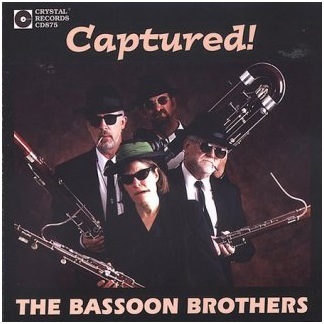 The Bassoon Brothers have been stirring up trouble since they began performing together in 1985. They have stolen material from string quartets, operas, symphonies and popular music, calling it their own with the unmistakable Bassoon Brothers stamp. Their first CD recording, Wanted for Low Down Playing and Bass Behavior on Crystal Records showed many of their musical crimes. They commissioned another known associate musical felon, a fellow bassoonist, Peter Schickele a.k.a. P.D.Q. Bach, for some hot goods and more rip-offs. The Bros’s CDs have been the number one selling recordings of all solo or group bassoon recordings on Amazon.com. The irreverence they demonstrate and their theft of musical material continued with the release of their 2002 recoding entitled Captured. Their newest thievery and contraband found in Escaped surfaced in 2007. What the bassoon does not have is respect. That’s why the Bassoon Brothers call it the Rodney Dangerfield instrument. Their mission is, first, for the public to quit calling it an oboe and, second, a call for more people to take the instrument seriously. They consider the bassoon to be an endangered instrument for lack of players. In the right hands, the “clown of the orchestra” is capable of great versatility and beauty as well as its role as a “belching bedpost”. In some reviews the Bros have been called role models for younger players, having given them material to enjoy the bassoon just for the fun of it. Through this approach they hope to attract more players to the instrument, which is their ultimate mission. As for getting respect, Vivaldi wrote thirty-seven concertos for the bassoon, more than any other instrument except the violin. Unfortunately, it’s been downhill ever since as a solo instrument. The composer Michael Daugherty, known for his strange and off beat compositions has featured the bassoon in an early composition entitled Dead Elvis, calling for the bassoonist to dress as an Elvis impersonator. When Michael Daugherty began composing his biker bassoonist bash–Hells Angels for Bassoon Quartet and Orchestra, where did he draw some of his inspiration? From a Bassoon Brothers CD, of course. He wanted to see what we were doing, especially the jazzy capabilities of the instrument. The Bassoon Brothers performed Hells Angels in biker gear in May 2002 recorded Hells Angels for DELOS on the American Contrasts CD. The Oregon Symphony is the back up band. The Bassoon Brothers are also affiliated with the bassoon section of the Oregon Symphony. Mark (head de ranger) Eubanks, his side kick Baker City Bob (de Viper) Naglee, Evan (de kid) Kuhlmann and the de Bro’s sole sister Bonnie Cox. The Bassoon Brothers can be seen on YouTube and have their own website (you’re on it!) to help promote the instrument and educate bassoonists through their entertaining tidbits about the ‘oondom and their popular advice column which receives questions worldwide from bassoonists, their parents, and band directors.